Pros: Annie Mackenzie’s concept and performance are sweet and charming. She is a joy to watch. Cons: The script is a bit unclear, needs development. This heartfelt exploration of grief and personal identity has strong elements, but there is room to grow. 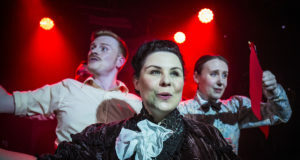 Annie McKenzie, a recent finalist in the TriForce MonolugeSlam at the Lyric Hammersmith, presents her full-length, one-woman show Happiness is a Cup of Tea at the Hen and Chickens Theatre this week as part of the Camden Fringe Festival. Happiness is a Cup of Tea revolved around Fiona, the youngest daughter of the recently passed Mary Nash. We first meet Fiona in her dressing gown, brushing her teeth as she listens to an audio book providing simple tips for writing a eulogy. The book frames the rest of the monologue, as Fiona thinks out loud, retracing memories, experiences, and impressions of her mother, her family life, and her personal history in an attempt to develop a eulogy for her mothers’ funeral. McKenzie is both writer and performer of the piece, and she exhibits a sweet sensitivity and clear talent for expression. The character of Fiona is deftly developed, and the language of the script is the perfect blend of common, relatable waxing and heightened poetics. McKenzie approaches guilt and grief with a lovable reality, incorporating humour, discomfort, and a full range of emotions into Fiona’s fragile state. While she has a clear voice and was compelling to watch throughout, McKenzie might consider revising the script for incongruities and confusion – I was unsure throughout about the status of the fourth wall – sometimes I felt directly addressed as an audience member, other times, though she appeared on stage alone and made no direct mention of company, Fiona addressed a mysterious “you,” referring to shared memories, and I found myself distracted with the question of who she was talking to. With McKenzie’s presence and knack for expressive language, a tightening up of the holes in the overall script would make this show truly one to reckon with. The charming Hen and Chickens is an excellent venue for the intimate production; the cozy upstairs black box was just the right size, though an unfortunate amount of noise does make it up from the bar below. This was soon forgotten as I became engrossed in the charming play, however. The stage was decked out as Fiona’s apartment – a half full bath-tub dominated the space, hosting a long and uncomfortable, yet fitting, moment in which Fiona times herself as she holds her breath beneath the water, emerging laughing and crying in equal measure. 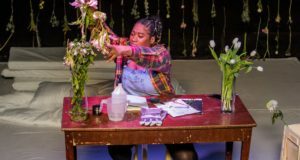 Overall, it is a sweet and nostalgic play about remembering one’s roots and relating to a lost loved one, and McKenzie proved herself as one to watch – she’s well on her way to mastering the art of the quirky, relatable, and heartfelt solo piece.